To make balls- Take a bowl and add all the ingredients except oil. Mix it well to make a soft dough. If there is a need add 3-4 teaspoon water. Prepare very small balls. Take a frying pan and heat oil. Deep fry all the balls in batches. Keep it aside. Take a pan and heat oil. Add onions and saute it for 2-3 minutes till it turns light brown. Add tomato puree, garlic paste, green chillies, salt and let it simmer for about 2-3 minutes. 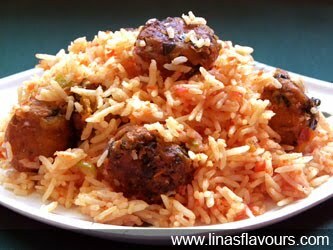 Add fenugreek balls, rice, mix it well, cover the lid and cook for 3-4 minutes on a low flame so that all the spices are mixed properly. Serve it hot with curd/yogurt or curry. You can have it just like that.